1. You need your iPhone or iPad to be jailbroken before you can attempt to unlock it. If your iPhone or iPad is not jailbroken yet – here is how to jailbreak your iPhone or iPad. 2. Latest version of iTunes. 1. Go to Cydia -> Manage -> Sources. Press Edit and Add repo.bingner.com as one of your app repositories. A bunch of Matrix like code will be installed and once finished without any error message, press Bingner and then press SAM package and install it. 2. Exit Cydia and locate the SAMPrefs icon in your home screen. 3. Inside SAMPrefs, go to Utilities -> Select De-Activate iPhone. Now go to More Information and make sure your iPhone’s or iPad’s activation state is Deactivated. 4. Take out your SIM (which is unlocked) and replace it with the New SIM. 5. Go to Method and change it to “By Country and Carrier”. Come out to SAM home-screen and change Country and Carrier of your new SIM. 6. Click on More Information again. Copy your IMSI (International Mobile Subscriber Identity) in SAM Details. 7. Click on Spoof Real SIM to SAM. 8. Go to the main SAM menu and change the Method to manual. Paste the IMSI in the field. 9. Connect the iPhone to iTunes. It might reactivate your iPhone. 10. Disconnect your iPhone when done and quit iTunes. 11. Disable SAM in the SAMPrefs app. 12. Connect your iPhone to the computer. iTunes will start up and tell you it can’t activate the iPhone. Close iTunes and open it again. 13. This time, iTunes will activate your iPhone and it will be unlocked! You can now use your phone in whichever way you want. Just remember not to upgrade your iPhone or iPad to the next iOS release as soon as it is out. If your push notifications stop working, go to SAM again and click on Clear Push then connect to iTunes again. This is a SIM unlock procedure and not a factory unlock procedure. If you change your SIM card for whatever reason, you will have to repeat the above procedure with every new SIM card you use. Both the above errors are related and they can be solved easily. 1.Ensure that the cellular network information entered is correct. 2. Ensure that you’ve installed correct version of SAM. Go to Settings -> SAM -> Utilities and tap on “Revert Lockdown to Stock” button. Your screen will appear to be hung. Some text will appear showing stockification success. This notification means you have got the right version. If a failure notification pop ups, you need to install SAM from original source. 3. Go to SAM preferences and tap on “Method” now select “By Bundle Name”. Now head back and tap on Bundle menu and select your carrier that you are locked to. 4. Now head over to SIM ID and select your SIM ID, if not sure just select the first one. 5. Now go to More Information and you will see ActivationState as Unactivated. 6. Plugin your iPhone or iPad to your computer. Once you’ve plugged it in, you will notice that your ActivationState has changed to WildCardActivated or Activated. Now you should have your iPhone unlocked and use it anywhere on the planet! Let us know if you had any issues or were able to unlock it successfully! I’ve had some drama and trama today trying to get a 3gs with IOS 4.3.3 unlocked today (it was already jailbroken). I’m using a 3gs phone that was locked with AT&T, and wanted to use it with an SFR SIM, but I’m currently in a third European country at the moment (where I’ve used the SIM to roam before, but on an earlier unlocked version of the iphone), and am wondering if that’s why I’m not able to get the SIM to work – because I’m trying to activate it with SFR in a third country? It’s a long story, I’ll spare you the details, but after the first successful unlock I can’t even recall now what happened, but I ended up being forced to restore the phone and didn’t see how to install the backup I’d made, so I installed IOS 5.1 for the 3GS, thinking I could just jailbreak it again. Of course, then iTunes saw that I had 5.1 and wanted to activate it, but I don’t have the original SIM (left it at home, and in any case, it’s no longer an active acct). So I found a fix online that ended up getting me beyond the activation, and jailbreaking. But aha, I didn’t realize that the big success story of the last day was the unlock of 5.1 and not UNTETHER jailbreak of 5,1. So I have had to do a tethered jailbreak . Anyway, tried this unlocking again, per your instructions, and got some errors. First, it wouldn’t deactivate the phone. It gave me the pop up saying it was deactivated, but when I checked under more info, it said it was still activated. Finally I noticed that SAM had some other text saying I needed to click another button dealing with lockdown or something, so i did. That ended up deactivating the phone. I followed the rest of your instructions here, then got the errors you describe above. So I followed your instructions and still got the same errors. Finally I decided that rather than “bundle” I would select “auto-detect”. That did in fact change my phone’s status to: wildcardactivated. But it’s still showing no service, and I’m wondering if that’s because I’m out of the country and it can’t activate the SFR sim? One other thing. When I pasted the ISMI in the field this morning, and tonight using your method, I seemed to be pasting the same number that was already there. It didn’t change. I’m wondering if that’s a clue to the problem as well. how do i “install SAM from original source”? i can’t seem to download the correct version of SAM for the rest of this process to work. please help! Bernard – You will have to do a tethered restart when using redsn0w. Sallie – Cydia -> Manage -> Sources and remove Bingner. Also remove SAMPrefs icon/logo from the home-screen if still present (ideally it would not be present). Start from step # 1 again. Mark – Does not matter where you are. This unlock process works anywhere and everywhere on earth! When your phone status says wildcardactivated – iTunes should be able to activate it in a couple of minutes. Also, you might have to repeat this process 2-3 times if it is not getting activated. Not sure of the reason behind it, but for most of us, who have been successful in unloclking their iPhone or iPad – had to do 2 or 3 iterations. Also, if you’re not sure what’s going on with activation of SAM. Please refer to “Known Issues” in this post. Your issue might get resolved if SAM installation went fine. Else you might consider reinstallation of SAM. Let me know how it went. Maybe we can work together on this if still an issue. 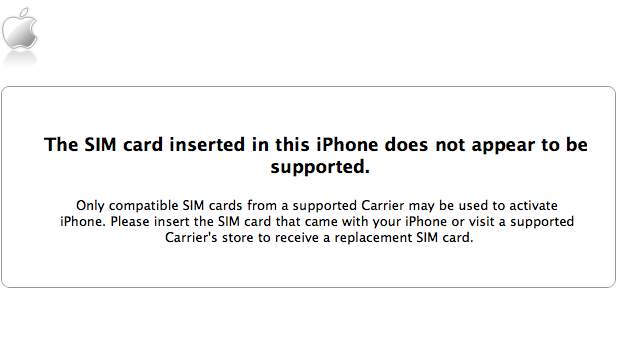 mine is a 4s locked to verizon…..i’m getting the error sim’s message…..what is the bundle name for verizon?? Basically, i installed SAM, and did what the tutorial says, and it worked fine, i was able to get texts and calls, could use 3G, the whole deal. But then it crapped out, i don’t know what happened, but it just wouldn’t show any bars anymore. It shows the 3G sign, and i can use 3g, like browsing the web and other internet dependent apps, can even use cydia. But i just cant send/receive texts or calls. I then upgraded my firmware up to 5.1 no JB (i was running 5.0.1) and it worked, like I could activate my phone, i could make calls and texts, again i had everything working perfectly. But then i jail broke it, and its gone back to the old problem, i can use the internet but nothing else. Someone please help…. Thanks Apurva, when you said repeat 2 to 3 times, do you mean the entire process, or just the last part about what to do if you get a SIM incompatibility error? And just to clarify, I don’t ever need to enter any information about what carrier the phone is locked to currently – and I don’t have my SIM for the carrier the phone is locked to, I only have the SIM I want to use. I want to make sure that isn’t part of the problem. First question I got is: will this work with iPhone 4 ios4.3 BB3.10? I am afraid to update to ios5.1 because I might not able to Gevey-SIM unlock it if I failed this SAM-unlock method. As of now I am relying with Gevey SIM unlcok. I tried to SAM-Unlock yesterday but it only ended me with stuck “connect to iTunes” screen and had to re-jailbreak it for me to be working with Gevey-SIM unlock again. I followed carefully the steps 1-9 but iTunes had this message in Step 9 “the SIM card inserted in this iPhone does not appear to be supported” so I tried the Steps 1-6 in the “Known Issues” but still iTunes told that “the SIM card inserted in this iPhone does not appear to be supported”. I have doubt maybe my iPhone running in this ios4.3 bb3.10 is not illegible with SAM-unlock or I am just missing this “select the carrier that you are locked to” in Step 3. Should I choose the carrier of original SIM card that came with my iPhone and that’s AT&T or my LOCAL SIM card I bought here in Bahrain? If you tell me that I should choose the network/carrier of my LOCAL SIM, well the carrier name of my LOCAL SIM is not in the list. runshabh – If you’re not aware: you need not provide the bundle name. just get in the option to provide the bundle name – come out and do the manual country and network selection. Mark – Sorry for the ambiguous answer – I meant just the last part. Mark – You need to provide the details of the new SIM. You don’t have to provide information of your old carrier (carrier your phone is locked to e.g. – AT&T). Shazaan – did you do a tethered jailbreak or untethered? JAY – iPhone 4 ios4.3 BB3.10 will work just fine – you will be able to unlock it. Infact, I’m uploading a video how to unlock a iPhone 4 iOS 4.1 version phone. iOS 4.1 got unlocked much easily than iOS 5.0 or iOS 5.1 versions. My original carrier is AT&T, so there are a number of SIM IDs I need to try, it’s not working yet. the problem is iccid and everything matches, but after sam is disabled and i reconnect, it says sim not supported again. Is dis method still working? The method works. I’ve used it to unlock 7 iPhones and 2 iPads (as you can imagine – not all of them are mine). All these devices were AT&T locked and are now in use in India. Please note that this method is SIM Unlock, which means that if you switch over to a new SIM – you’ll have to repeat the process once more. Also, I see some sites claiming that country and carrier belong to the one your device is unlocked to. I could not disagree more. Think again – why would you feed in information of your old carrier which you can no longer use? Doesn’t make sense logically. Well, to confirm, I used details of my new carrier and threw the AT&T SIM in the dustbin.